Need a policy for filtering the web activity of anyone on your network? Would you like one that is easy to apply and that won't make you have to install extra software and hardware to run it? 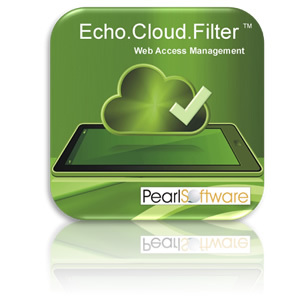 Then Pearl Software's Echo.Cloud.Filter Internet Filtering is what you're looking for. Operating system and platform independent, the Echo.Cloud.Filter offers full control of your workstations as well as your WIFI and BYOD (bring your own devices) users. View how easy it is to configure Echo.Cloud.Filter. See how Pearl cybersecurity product specifications meet your requirements. Put your cybersecurity in the cloud. Our DNS servers have the added ability to determine if a website violates your desired filter rules before it returns a website's IP address to network and guest users. Your computers, tablets, smart phones, etc. simply need to be set to perform DNS lookups at our Echo.Cloud.Filter. Because we host DNS servers that are categorized based on site content, companies and organizations find Echo.Cloud.Filter to be the perfect web filtering solution. Echo.Cloud.Filter is extremely easy to deploy and requires zero maintenance and oversight. The DNS requests of network users and guests are simply pointed to the Echo.Cloud.Filter, and you instantly have in place a policy for web filtering without needing to add any extra software or hardware. Our DNS servers are redundant and multi-tiered, capable of filtering every URL request and either honoring them or redirecting them to a warning page that you select.